The design for Cheryl's Brooch was inspired by a piece of cracked dry soap! 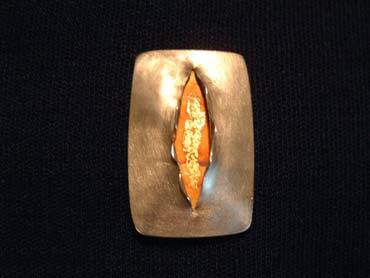 The brooch is shallow formed from silver sheet with a flat soldered back. The inside of the split 'pillow' form has been lightly oxidized to a yellow colour with a ragged patch of applied gold leaf. The outer front of the brooch is satin finished with the folded back edges high polished. The brooch is fitted with a roller clasp safety pin.